Five Minutes With… is a regular series spotlighting vibrant, innovative, sustainably-focused brands so you can get to know the best and brightest in the industry, even if you only have a quick coffee break to spare. This time we’re spending five minutes with Nikita Margarita, founder of Doodad and Fandango. How would you describe Doodad and Fandango to a complete stranger? 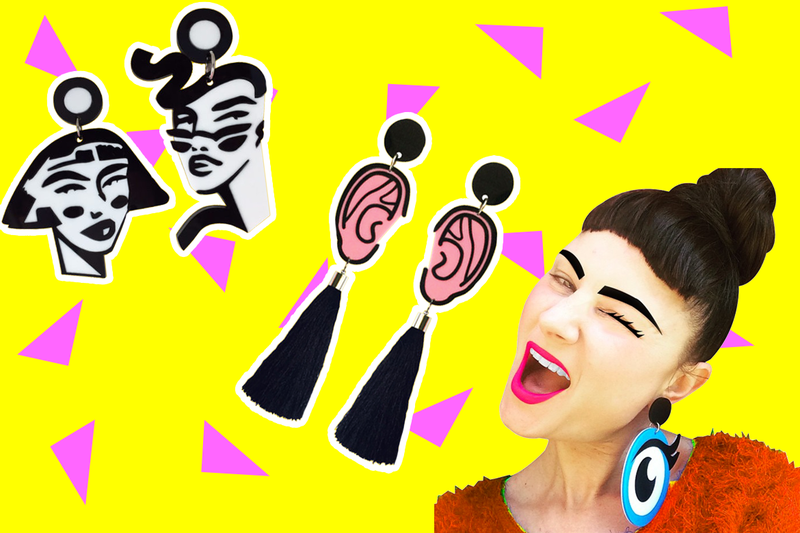 D+F is a fun, pop-art accessories label. We’ve become known for our larger than life, plastic statement earrings. I studied Jewellery and Object Design at college, and the brand has grown out of my obsession with adornment and fashion. What does Doodad and Fandango jewellery say about the wearer? They have a sense of humour and love having eyeballs. Following trends: yes or no? Mmm, there are so many trends. There’s a trend on right now for tiny weeny earrings, which is quite the opposite of what I make! I’m inspired by what’s gone on before me than what’s in the chain stores right now. But while I never set out to slavishly follow trends ’cause how UGHHH is that, you can’t help but be inspired by what’s happening all around you. You’d have to be dumb, deaf and blind to not be absorbed into the zeitgeist. Yes, all of my Perspex waste is recyclable. I’m an obsession recycler and have just discovered Redcycle, so I’m really excited that I can take all of my soft plastic waste there from my business and home. Our packaging is all recyclable and I’m also really happy to have made arrangements with an artist friend who’ll be taking all of my laminate waste to use in his art practice. How to you make Doodad and Fandango sustainable? – I only make to order, and everything is made on premises in my home studio. – As much as possible, I source materials from local suppliers. – Being a small operation, I can keep my eye on every step of production and make every choice as environmentally conscious as possible. – Making pieces that last and that are well made is an important aim of my practice. If anything does break, it can usually be resurrected and I’m happy to fix if possible for a minimal costs. Let’s keep looking and feeling fabulous and doing the same for our planet! I’m not here to be the coolest or prettiest girl in the room, I want to make myself happy. And finally, if you could chose one thing in your shop to wear forever what would it be? This would have been an easier question to answer a year or so ago, but now my archive of designs has grown so it’s getting harder and harder to choose favourites! The ridiculous pieces with a sense of humour are my faves, like the oversized tooth and ear earrings. I like feeling people’s puzzled glances! I’m not here to be the coolest or prettiest girl in the room, I want to make myself happy. I figure these are statement pieces so go to town with it and make the biggest statement you can to express yourself. Head over to Doodad and Fandango to invest in some of the most perfectly outrageous jewellery you’ll ever lay eyes on, all made with our planet in mind. Nikita will even design and handcraft your very own doppelgänger to hang from your lobes!